You make the appointment a month in advance. You get a sitter and even have her show up early so that you can arrive early. You walk through the office doors with time to spare. As you sign in at the front desk, the receptionist smiles at you. We will be with you in a minute.” She directs you to the waiting area where stacks of well-read magazines are scattered around. You have learned from experience that it is not going to be a minute. We all have to wait. Sometimes the waiting happens at the doctor’s office. Sometimes the waiting happens in traffic. No matter how well we plan or schedule, the waiting happens. The time that each of us spends waiting could fill a calendar year in most of our lives. You have to wait, but you are not required to just toss that time away forever. Find ways to make the waiting work for you. – Plan a menu. You have been promising yourself that you would plan all the meals your family is going to be eating over the next several weeks. It will make it easier to do the shopping and even keep your meal times on track. Not only does waiting offer the time you need to complete your menus, but the waiting room is usually full of great recipe ideas in all of those old magazines. – Catch up with others. In this age of instant messaging and emails, it is a treat for people to get snail mail that is not a political advertisement or bill. Bring along some stationary and pre-addressed envelopes. Write out a note or two while you wait and then mail them after you leave. – Bring your own reading materials. The magazines are not always enough to keep your focus during the wait. Bring along that book you have wanted to read (or finish). Try to keep your reading material light or at least the material that will be easy to pick up and put down as you are interrupted in your waiting by changes between waiting areas. – Bring along your hobby or craft. Maybe you sketch or write. Maybe you do cross stich, crochet or knit. The minutes you spend waiting (or in some cases the hours) can be just what you need to finish your project or maybe even start that next great masterpiece. Waiting was the inspiration for this article. – Find an article you can use and ask if you can take it home or get a copy. Skim the racks and find some titles that seem to match your current needs. You can find all the bits and pieces from one magazine or pick up several and keep them next to you. 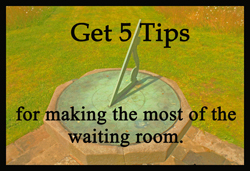 Be sure you take at least one back with you when you are moved to the room (also known as the second waiting room). Time is the only commodity you will never be able to replace. Make the most of what you have by putting your waiting time to work. Prepare for your appointments so that any waiting you do will not be a waste.